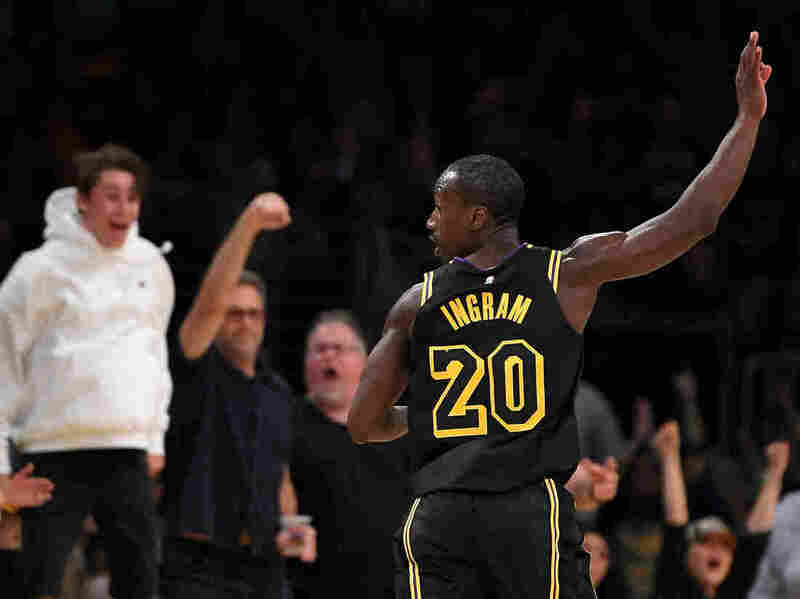 Andre Ingram, 32-Year-Old NBA Rookie, Floors Crowd With 'Helluva Opening Night' : The Two-Way After a decade in the NBA's minor league, Andre Ingram finally got his shot — and he made it count. By the game's end, the rookie with the gray-speckled hair had earned a chorus of "MVP" chants. Andre Ingram celebrates after draining a 3-pointer during the second half Tuesday night. Andre Ingram didn't know why his exit interview had been bumped up a day. But he had his bags packed anyway. A longtime veteran of the NBA's minor league, he knew there was no need to dawdle after his season wrapped with the South Bay Lakers in El Segundo, Calif., especially with his wife and their daughters waiting for him in Virginia. By the end of the meeting Monday, though, it was clear they would need to be coming west instead: For the first time in more than a decade spent grinding in the minors, Ingram, 32, was getting called up to play with the Los Angeles Lakers through season's end. Then, the NBA rookie with the gray-speckled hair just went ahead and dropped 19 points on the league's top-ranked team. On Tuesday night, playing at LA's Staples Center before his family and nearly 20,000 strangers, Ingram came off the bench against the Houston Rockets to drain four 3-pointers on his way to one of the best debuts in Lakers history. Only franchise superstars Magic Johnson, Nick Van Exel and Jerry West — "You may have heard of them," deadpans ESPN Stats & Info — scored more in their rookie openers with the Lakers. Before the game's end, the crowd had erupted in chants of "MVP!" — and they weren't referring the Rockets' James Harden, this year's presumptive most valuable player. They were cheering for Ingram. "From the team warm-ups, the atmosphere — it was electric," Ingram told reporters in the locker room after the game. "You could feel something in there, and you know, people are going crazy. MVP chants — that's crazy, man." He was at the free throw line when he heard them. "I'm just glad the free throws went in, to be honest," he said, laughing. Now, Ingram may be a rookie by one measure — but by another, he is a grizzled veteran: He has been in the NBA's developmental league since 2007, when he went undrafted after graduating from American University with a physics degree. But as he told his local Richmond Times-Dispatch more than a decade ago, his eyes have always been on the NBA: "You get more NBA exposure in the D-League — that's why I chose it ahead of going overseas," he said at the time. Since then, ESPN Stats & Info notes, Ingram went on to rack up the most 3-pointers in the history of the minor league, which has at times gone by the names D-League and G-League, and played in the second-most games in league history. But all the while, he just kept waiting on that call from the majors. As NPR's Tom Goldman reported in 2016, the life of a minor league basketball player is not a glamorous one. Average pay for a season is about $20,000; players get from city to city by bus and sometimes play in front of crowds numbering in the dozens, not thousands. It's not an easy road for a father of two like Ingram — and certainly not for his wife, Marilee. "Obviously," Ingram said after the game Tuesday, "it's not a cash cow — so, I mean, if at any point she was like, 'OK now, you've chased long enough, we need to do better,' what can I say. But she never said that, never even thought it. She kept encouraging me." When he called Monday, "I thought he was calling to tell me when he was coming home," Marilee Ingram said during the broadcast, voice breaking with emotion. "But when he said he was being called up to the Lakers, I literally lost it and started screaming." "As soon as he was done signing," she added, "he called me back and was like, 'OK, you have to pack because you are coming out here to see these last two games.' "
She and their daughters came right out. They were on hand to watch him play — and to hear those MVP chants ripple through the arena, even in the Lakers' 105-99 loss to the Rockets. In the locker room after the game, Lakers coach Luke Walton presented Ingram with the game ball. And he summed it all up pretty succinctly. "Ten years," Walton said, shaking his head. "Helluva opening night."